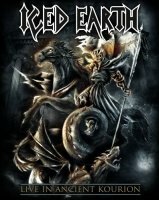 A must own for any Iced Earth fan, avid or not. This live DVD came as a nice surprise when it popped out the promo package especially as I reviewed the 'Dystopia' album last year and also covered the London night of this actual tour. From the second I picked it up I have to admit I was pretty impressed. Jon Schaffer and the guys have decided that if a second live DVD, (third including the mixed event DVD 'Festivals For The Wicked'), was worth doing it was worth doing on an even bigger scale than their first, 'Alive In Athens'. This is however the first official filming of a headline show by IE and they choose the Cyprus gig – played in the Ancient Kourion Theatre in Limassol with all its 6000 year history. The biggest single thing that stands out is the scale and length of the set list. For this special performance the band put together a collection of twenty seven songs which ended up lasting two and a half hours. There's plenty of classic Earth songs such as 'Burning Times', 'Stormrider', 'The Hunter' and even a seventeen minute rendition of 'Dante's Inferno'. Intermixed between these are tracks from the latest album including 'V', 'Dark City' and 'Anthem'. It really is a pretty comprehensive collection of Iced Earth material all well performed on the night. In addition to the live show there is a thirty minute 'Making Of' documentary, a shorter 'World Tour' film and a photo gallery. This is also being issued as a live album with various versions including colour vinyl. I have always considered Maiden's live DVDs to be as good as it gets and the industry benchmark. In my opinion this live effort from Iced Earth is every bit as good as most of the Maiden live releases. The show may not be quite as theatrical but from the production, sound and visual perspective this is every bit as good. Audibly the sound is first rate; you can hear every guitar stroke, drum strike and vocal wail crystal clear. The crowd are turned up whenever they are called on and are in good voice as well. The picture quality is as sharp as any recorded live show I have seen. Apparently, with this being a DVD5 promo copy the quality of the released product will be even better. If I have one technical quibble it's that the editing is as furious as the guitar playing and at times it's so quick it's difficult to take in everything in shot. But that aside, this bought back some fine memories of a good night as well being an excellent watch. I can safely say this is pretty much a must own for any Iced Earth fan, avid or not. But if you're a fan of high tempo, high energy metal shows in general you should also go and investigate this superb live DVD.